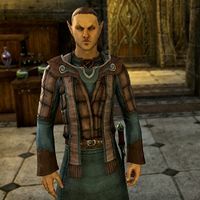 Curinure is an Altmer Magister of the Mages Guild in Vulkhel Guard, responsible for recruiting new members to the guild. "Welcome. Are you here on Mages Guild business?" "Yes, of course! We're lorekeepers across the face of Tamriel. Guild members seek out books, tomes, and ancient scrolls in their travels. Why don't you speak with me for a moment? Perhaps you'd like to join!" Let's talk about the Mages Guild. "Always good to speak with another knowledge-seeker. Guildmaster Vanus will be pleased!" "Welcome to the Guildhall, knowledge-seeker. What brings you here today?" What can you tell me about the Mages Guild? "We're bookhunters, of a sort. We seek out new information, capture it in our libraries, and make copies for distribution across Tamriel. The Guild doesn't care about battlefields, or boundaries. Just knowledge and the acquisition of new tomes." "We provide training in unique spells and abilities only available to members! And from time to time projects crop up for those with an adventuresome spirit. You may end up working with the Guildmaster himself!" "Vanus Galerion, one of the founding members of this august body. Still holds the proud title of Guildmaster, overseeing every guildhall in Tamriel. He works with other ranking members, such as Telenger the Artificer, to ensure our future success." You're not affiliated with the Aldmeri Dominion? "We are neutral in the war between the three Alliances. While many of us here in Vulkhel Guard hold true to the Eagle banner, when we're on Guild business we kneel to no king or queen. That's why you'll see members of every race in our halls." I'm ready to join the Mages Guild. "Excellent! You are now a Student of the Mages Guild! Every book you find will now earn you reputation in the guild. I suggest you begin by talking to Valaste, our Mistress of Incunabula. She often has tasks for new recruits. Good luck!" After you've joined the guild, he will greet you enthusiastically. "Good to see you back again, Adept. The Guild is stronger with you at our side." Curinure can also be found in the Vivec City Mages Guild and the Shimmerene Mages Guild. This page was last modified on 1 March 2019, at 00:17.